1. This NEW generation (Version 5in1) of Notebook POST CODE Testing Card supports five bus interfaces: MINI PCI, Mini PCI-E ,LPC.ELPC and I2C (Notebook Battery Interface) . 2. This card is easy to use for end users and it works with high stability. It is your ideal and useful tool for notebook repairing partner. It can diagnosis signal which show the problem of CPU, Memory, display card and so on. 3. LED displays shows diagnosis result of motherboard. Especially helpful to pinpoint where is the problem when power on the computer and find no display or machine hang. This is used to display the Error-code and RST/CLK signals. 4. The Display portion is composed with two 7-segment LEDs. The two "Dots" of the LEDs are used to indicate the notebook "RST" and "CLK" status. The left side "Dot" is for "RST", and the right side "Dot" is for "CLK". When the notebook is in "Reset" status, the left side Dot" will be lighted. And when the notebook has a correct CLK output, the right side "Dot" will be lighted. 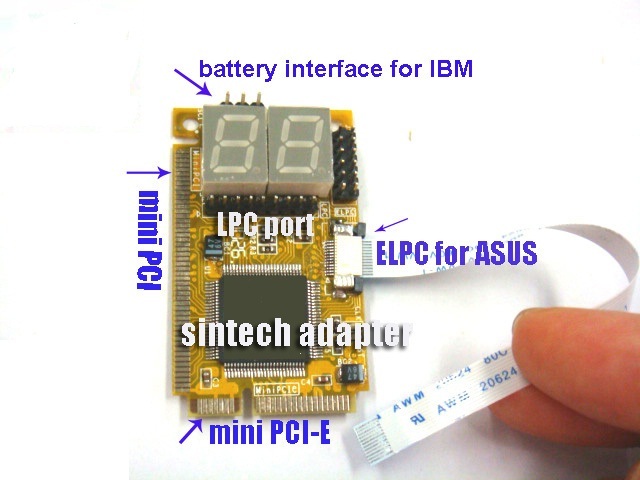 5. two new tester ports: The ELPC interface (Dedicated for ASUS notebook) and The I2C interface (Dedicated for IBM Battery Interface) . Note: Please be aware that Mini-PCI-E is supported with limitation model of notebook, and the pin orientation must follow to PIN1-3.3V, PIN2-LFRAME#, PIN3-LAD3, otherwise, it need to test with other port, such as LPC or mini-pci. However, it can work with most of notebooks.